Distorted trees, bent by time (and my camera lens). Veined branches reaching out as for connection. A reflection of their roots, underfoot, meandering amidst the enriched soil. Sun flare dissipates between the wood bark and stone mausoleums. The dead, evanesced (stretching the meaning of this by using it in this context….perhaps) from earlier centuries, crammed together with the recently mourned to make a collective memorial. Green moss on grey stone. An unkindness of raven coloured birds, cawing across the sky - unencumbered by glass and metal structures, free from bricked buildings topped with chimneys - a rarity in a City - the trees being the only markers on the skyscape within these walls. Did you know that a group of ravens is known as a conspiracy or an unkindness……even treachery? Descriptions that are contrary to the birds themselves - incredibly social animals. The description lends itself to our greatest fear - death. Ravens, throughout lore, being associated with it. Birds of prophecy. They are intelligent and have incredible memories. It seems apt that they make their home here. Images shot using a Nikon D7100 with a 12-24mm lens. 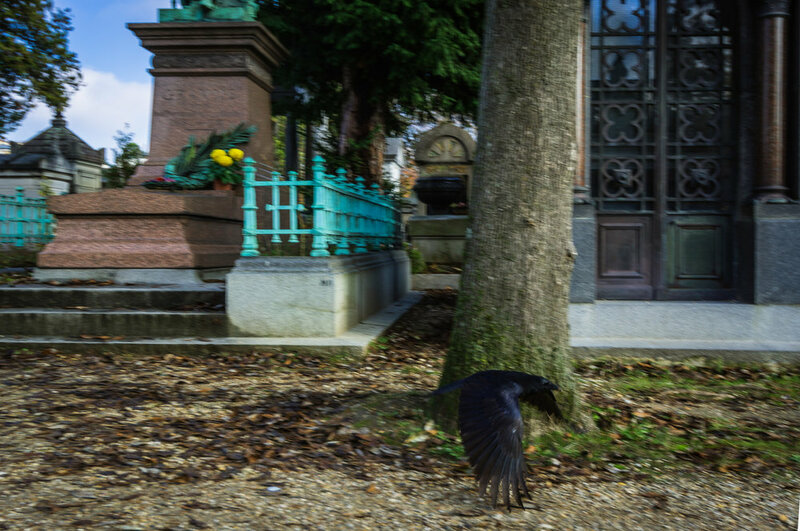 I spent a few hours just wandering around Pere Lachaise cemetery. I cannot wait to return. The best of Paris is here.